Meets Friday, on or before the full moon at 8:00pm. meets each month on the 2nd Wednesday at 8.00 pm. meets each month on the 3rd Thursday at 8.00 pm. The hall is situated in the centre of Belfast’s busy shopping district adjacent to the new Victoria Square shopping mall. Recently renovated the hall is now the main accommodation for Lodges in the City of Belfast. meets each month on the 3rd Thursday at 6.00 pm. meets each month on the 3rd Tuesday at 6.00 pm. meets each month on the 3rd Wednesday at 6.30 pm. The hall is located on the right just off the main roadway travelling from Moira to Belfast International Airport. The hall is located at the end of the village on the right when travelling from Bushmills and immediately on the left if travelling from Ballycastle direction. The hall is clearly identified by the name on the front. Ballintoy, which is now the oldest lodge in Carey and Dunluce. In fact Warrant No. 403 was granted to Ballintoy in 1763. On the 23rd June 1817 it changed Warrants to its current No. 38. The hall itself is one of the first buildings you see as you drive into the village. Situated on the left hand side, it is a granite structure and was built in 1805. It is a two storey building and has been renovated recently. The ground floor consists of an entrance hall, toilets, store room and a kitchen furnished with tables and chairs where the Brethren can have a cup of tea after labour. The Lodge room on the first floor would be considerably less than 700 sq. ft. Items of interest in this room are a display of old silver Officers’ jewels,. Five of the jewels in the case were used by the original Lodge No. 403 from 1763 until 1963 and the other five are all that survives from the neighbouring Masonic Lodge No. 146, Lisbelnagroagh, Bushmills which was granted a warrant on the 28th July 1854. Turning off the main Carrickfergus to Larne road, Ballycarry in clearly signposted – travel up the hill and the hall is situated on the left. There is limited parking. Travelling from the Diamond towards the sea front the hall sits back from the road on the hill on the left hand side just after passing the road side buildings. There is an entrance to a large car pary directly opposite to the hall on the right. No. 89 Ballycastle which is situated on the Main Street of the town, known as the Quay Road. It is built on an elevated site approached by 17 steps and 3 sloping platforms. It was built in 1884 and was Constituted on St John’s day the 24th June 1884. The hall was renovated in 1974 with a kitchen added on. It is a two storey building although the first floor extends only to about a quarter of the whole building the main Lodge room itself is approximately 1600 sq. ft and of course there is in addition the front porch, the dressing room, kitchen, toilets, and a small lounge. Items of interest in the hall consist of two tracing boards bought from George Kenning of London which date back to 1880. They are copies of the famous Harris Pattern boards, about 24in by 12in, framed with a black gloss surround. An old fashioned chair sits in the hallway, which belonged to Lodge No.19 and dates back to 1830. There is a framed picture of Sir Frederick Boyd, presented in 1899, whose family granted the grounds on which the hall stands. He was a member of Lodge No. 89 Ballycastle and Apollo Masonic Lodge, Oxford. The Apollo Lodge in Oxford was also the mother Lodge of the first Provincial Grand Master of Carey and Upper Dunluce, Rt. W. Bro. Walter Bishop Mant. The most interesting item in the hall is an old Scottish sword of great antiquity. It is thought to be the kind of weapon that was used at the battle of Culloden. 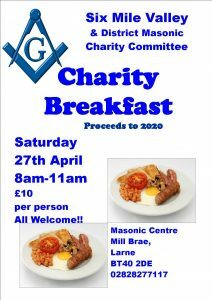 Ballymoney Masonic Hall is by far the most famous Masonic building in Carey and Dunluce. It has a long history and stands right in the centre of Ballymoney town at the top of Main Street and indeed houses the town clock tower. The present building was erected in 1755 by the Earl of Antrim. In its long history it has been used as a courtroom and a jail, a market house, a town hall, a library, a school, a place of worship for Roman Catholics and a Presbyterian Sunday school. It gained notoriety as a place of hanging during the United Irishmen’s rebellion of 1798. Two United Irishmen were hanged from the clock tower. The Masons of Ballymoney bought the hall in 1907 with a promise that the Council would look after the upkeep of the clock and clock tower. The building is a large three Storey construction of great architectural beauty with large arched windows and the clock tower attached to one end. The centre of the building is much higher than the rest of the building. The campanile now above the clock is in accordance with a continental design and there is a weather vane in the shape of a salmon. Inside on the ground floor there is a very large robing room and toilets. The first floor is approached by a winding stairway and here we have another large dressing room and the Lodge room itself, which is approximately 1000 sq. ft. The walls are panelled half way up to which is an extremely high ceiling and is very tastefully decorated and well fitted out with furniture and carpet. The first Lodge ever formed in Carey and Dunluce was in Ballymoney in 1743. It was Lodge No. 135. The Masonic bodies which sit in the hall today are two Craft Lodges, No. 57 and No. 330, one Royal Arch Chapter, one Council of Knight Masons and one Preceptory. The contents of the hall include a very nice box type Master’s chair made from old mahogany by John McElreavy in 1817, at a cost of £20.00. In the anti room hangs the only three proper tracing boards in Carey and Dunluce. They are 3.5 ft. wide 6 ft. high and are painted on canvas and were presented in 1908. They are a most beautiful example of tracing boards. On the stairs there is a large heavy carved wooden coat of arms of the McDonell family, who were the Earls of Antrim. The hall is on the right hand side of the main street in the village when travelling from the Ballymena direction. There is no car park and limited on street availability. From the square take the road for the Giants Causeway and the hall is a short distance along on the right. Bushmills, where Whiskey has been distilled since 1608 and Masons have practiced their strange rituals since 1764, when the first Warrant No. 414 was granted to the town of Bushmills. Sir Francis E. MacNaughten donated the site in the centre of the town and the other two Bushmills Lodges, No. 48 and No. 414, then helped raise the balance of funds and the new hall was built. Of these three original Warrants that met in the district, only Bushmills No. 414 still survives. Carareagh No. 374, was granted its Warrant on the 5th of November 1855. This is the smallest hall in Carey and Dunluce and measures 17ft by 29ft on the outside walls. It was built in 1872 and is a one storey semi detached building, pebble dashed with what it known locally as Ballycastle dash, which is a light gravel washed into the nearby coastline, close to Ballintoy Harbour. The building consists of a small entrance porch and main hall which seats about 45 at total capacity. Needless to say when this takes place the ritual that we Masons know as Perambulating the Lodge cannot be enacted. There are several items of interest in the hall including two beautiful old Masonic Beer Jugs inscribed “Carareagh Masonic Lodge No. 374”, dated 1898. They are very intricately designed with coloured Masonic symbols and the only other jugs like them that I know about are in the museum in Molesworth Street. There is a clear wine bottle with no date. It is a very curious ornament, filled with carved wooden Masonic symbols built inside the bottle as one would build a ship in a bottle. Other small items of interest include a soap stone carved in the shape of a horseshoe with Masonic symbols carved on it, including the compass and square. A silver level of great antiquity with a crudely carved Sun, a hand holding a trowel and a cable tow and of course a compass and square. There is also a very old collection of delft used by the Brethren many moons ago for a cup of tea or maybe something stronger, like some of the locally brewed poteen. Cararreagh was once noted for its tradition of having a goat tethered outside the front door of the Lodge Room. Driving through Carnlough, turn left at the harbour and follow signs for a Car Park. The hall overlooks the car park from the hill behind it. Travelling along the coast toward the castle turn left (or right) on the roundabout in front of the castle and follow the signs for the Railway Station. Turning left towards the Railway Station the hall is situated on the left hand side of the street. The hall is on the right hand side of the main street opposite a large Spar Supermarket. Sitting on the main coast road through Glenarm the hall overlooks the small roundabout as the road turns right toward Carnlough. Turning off the main coast road for Islandmagee you approach a crossroads where you turn left for Ballylumford. This road lead straight to the hall approx three miles distant and clearly visible on the right hand side of a junction and gentle bend in the road. meets on the 2nd Friday in the months of March – May – September and November 7.00 pm. Lodge, No. 280 Moyarget. This Lodge was granted its Warrant on the 1st March 1821. The hall built 1961 for a cost of £2868.00. The hall was dedicated on 30th September 1961 and is a modern building with toilets, kitchen, cloakroom, hall, ante room and main Lodge room, which measures 800 sq. ft. It is oil heated and the Brethren take great pride in its upkeep, doing something every year to improve the fabric and comfort of the hall. Being a relatively new building it has not many contents of interest or of any value. The original foundation stone of the old hall has pride of place in front of the Master’s dais and the Dedication Stone has been built into the wall of the ante room. Amongst the Lodge treasures are the original hand painted pine Ballot box, an engraved Waterford goblet with Masonic symbols dating back to the 1840’s and in the main hall is the silver trowel used by Rt. W. Bro. Rupert Stanley in 1961 to lay the Foundation Stone. This trowel was given to Ark Lodge No. 10, Belfast by Rt. W. Bro. Stanley’s widow and they, in turn, returned it to Moyarget. It now has pride of place on the back wall of the Lodge room. One other Memorial in the Lodge room is to the memory of W. Bro. Johnny Moore, Lodge Secretary between the years 1970-1978, who was brutally murdered on his farm along with his sheepdog and a pet lamb, as a result of a terrorist landmine. On the walls of the Lodge room are W. Bro. Moore’s M.M. Certificate and his P.M. Certificate. On the west wall is a collection of photos of the dedication of the hall taken by the late Rt. W. Bro. Harry Irwin, who had been the photographer on the day. Portrush, is the best situated hall in Carey and Dunluce for it is close to the towns of Portstewart and Coleraine, a densely populated district known as the Triangle Area. The hall is close to a large car park. It was dedicated on Monday, 18th September 1924 by the Provincial Grand Master, Brother J.H. Stirling for Union Lodge No. 1008, who were granted their Warrant on the 1st April 1813. The hall looks from the outside as though it is a two storey building when in fact there is a caretaker’s flat, which has now become derelict. The ground floor consists of an entrance hall, cloakrooms a toilet and a large dining hall. In this dining area there is a display case. 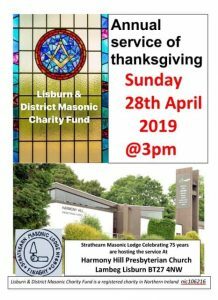 As you proceed up a very grand wooded staircase past a most beautiful coloured leaded window, matched by others in the Lodge room itself, you enter the hall from a small ante room where the door opens into the grandest Masonic temple in the Carey and Dunluce area. It reminds us what a rich man’s club room would have looked like 70 years ago. The interior of this room is richly decorated, furnished to capacity with the best furniture available. It has many fine pieces of interest. To give you some idea about its contents, in the glass cabinet are two tunic buttons from The First Volunteer Lodge, No. 620 Dublin, dating from the 1798 rebellion. These buttons are reputed to have belonged to that famous United Irishman, Henry Joy McCracken. Vow Ferry got its name from a ferry that conveyed passengers across the River Bann. Vow Ferry was granted Warrant No. 17 on the 12th October 1839. The current hall is a two storey building built in 1905 with a slated roof and dashed painted outer walls it has been renovated in recent times. The ground floor consists of an entrance hall, a pool room, toilets and a large function room of approximately 1800 sq. ft. The stairway leading to the ante room and the Lodge room are all panelled in mahogany coloured sapele timber. The Lodge room itself is approximately 1000 sq. ft. and seats 55 around the walls and if required could seat up to 85 and still leave plenty of room to carry out the ritual. One very nice feature of the room is the ceiling which is panelled in oak timber, the shape of the outer roof. The only item of interest in the hall is the Master’s Chair, which is intricately carved with Masonic symbols painted on. The seating in the Lodge room is strange in that they are upholstered bench type seats, each bench having six wooden arms and a man of broad girth would have difficulty getting in between the arms. There are no more items of interest or any great value in this hall except one very important fact: it was in this hall where the greatest Formula One motorcycle road racer of all times, Joey Dunlop, became a Master Mason.